Israel Bars One of its Most Prominent Critics, Norman Finkelstein, for Ten Years | Democracy Now! field representative of Israeli human rights group B’Tselem in the Hebron district. Ha'aretz Editorial: "Who's afraid of Finkelstein?" Norman Finkelstein joins me now in the firehouse studio. We’re also joined on the telephone from Hebron by Musa Abu Hashhash, Professor Finkelstein’s friend whom Norman had intended to visit. We called the Israeli embassy and the New York consulate to invite them on the program, but they declined our requests. Welcome to Democracy Now!, Norman. JUAN GONZALEZ: So tell us, what happened when you arrived at the airport, and what did the Shin Bet ask you when they held you? NORMAN FINKELSTEIN: Well, I presented my passport at customs. My number was entered into the computer, and they asked me to go to the waiting room. I was then questioned or interrogated — [inaudible] more questioned — by a fellow from maybe immigration, maybe security, I’m not sure. And he asked me a wide range of questions: why was I going? Who was I going to see? Eventually he asked me whether I had ever had contact with al-Qaeda, whether I was on a Hezbollah mission, and so forth. And then after several rounds of questioning, I was told that I would be — I would not be allowed in. I asked how long would that ban last, and he said at least ten years. But then I was taken to a holding cell at the airport where I was kept until about eighteen hours, and then I was sent on a KLM airline back to Amsterdam. JUAN GONZALEZ: And the reason for holding you for eighteen hours? NORMAN FINKELSTEIN: The next flight out. The rule is they send you back on the plane you came in or the airline you came in, and the next flight out on KLM was the next morning. JUAN GONZALEZ: Now, you’ve traveled back and forth to Israel many times. Why do you think this has happened now? NORMAN FINKELSTEIN: I really don’t know what happened this time. I’ve been there about fifteen times, not to split semantical hairs, but I’ve never really spent time in Israel. I’ve traveled to the Occupied Territories, and I have to pass through Israeli customs. But my trips have been mostly, if not entirely, of a personal nature, to see a very close friend of mine in Hebron. JUAN GONZALEZ: Now, we also have on the phone, Musa Abu Hashhash, who was the person you were going to visit? JUAN GONZALEZ: Welcome to Democracy Now! JUAN GONZALEZ: Yes, welcome to Democracy Now! Could you tell us when you heard that your friend Norman had been held at the airport and what you learned? MUSA ABU HASHHASH: [inaudible] I was shocked, you know. I didn’t expect Israel would, you know, come to this kind of decision, you know? Norman has been visiting us for fifteen times, and every time it was OK. He spent for night — ten days at our home, and we are friends. You know, I never, never thought it would happen. It was painful to us, to my family, to my children, to my wife. You know, all, we cried and did not understand now — ’til now what happened. Why? JUAN GONZALEZ: Now, you work with the Israeli human rights group B’Tselem in the Hebron district. What do you do with them? MUSA ABU HASHHASH: You know, I called my friends, I called our director of B’Tselem, and, you know, I asked my director to call the lawyer, you know, the lawyer. Also, I called my friend Gideon Levy, the Israeli reporter in Haaretz. And, you know, we wanted to do anything to stop this action, this stupid action. JUAN GONZALEZ: And, Norman, has there been anything in particular — obviously you’ve been a vocal critic, a prominent critic, of the Israeli occupation of the Occupied Territories. Now, is there anything in particular in the last year or two that you’ve been publicly involved with that might prompt the Israelis to feel even more need to keep you from the country? NORMAN FINKELSTEIN: Well, I guess there are two possibilities. One, I think I’m more effective than I have been in the past. I draw fairly large audiences. And I think Israel is now facing a major public relations challenge. They’re losing the moral ground. They’re losing. And that’s plain. And I can say, in my own small way, I’ve contributed to isolating Israel in public opinion. And the second possibility is that I did spend some time in Lebanon in January, when I — where, among other things, I met with several leaders of Hezbollah, and that received fairly wide publicity, and that may have prompted the outrage or the decision. JUAN GONZALEZ: And your reaction to the editorial in Haaretz blasting the government’s decision? than me being denied tenure in the United States evoked outrage among mainstream and even left publications in the United States. JUAN GONZALEZ: And, of course, they pointed out in the editorial that as a Jewish American, you have the right to immigrate to Israel, but now they are banning you from visiting. NORMAN FINKELSTEIN: Yeah, there is a question which I’ve been discussing with an Israeli lawyer, whether to exercise the option of using the law of return to go and then visit my friend, but that race is obviously principled issues of I don’t believe in the law of return in the first place, and so to take advantage or exploit the law, which I think is politically and morally unacceptable, for my own purposes. It’s unclear how I’ll proceed. JUAN GONZALEZ: Alright. 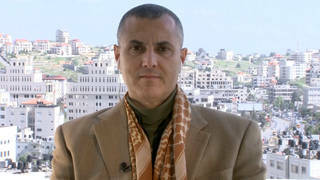 Well, I want to thank both of you for being with us, Norman Finkelstein, author of several books, including The Holocaust Industry: Image and Reality of the Israel-Palestine Conflict and Beyond Chutzpah, and also Musa Abu Hashhash, the field representative of Israeli human rights group B’Tselem in the Hebron district.